Engrave your way to eternity. Exclusive engraving on wood for personalized plaques. All plaques are engraved using state of the art LASER engravers on wood. Excellent for desktops. Makes a unique personalized gift. Engraved prints or wood prints give meaning to a present. It tells the recipient of the gift that you put in a lot of thought into their present. When you personalize the engraved wooden print, it increases its value in your loved one’s heart. Forever, the wonderful gift will be a sweet reminder of the loving and caring relationship you share with them. 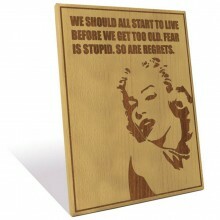 You can present the engraved wooden plaques to your mother, father, sibling, partner, or friend. Since our photos on wood are completely customisable, you can choose the size, text, and the font colour. Even if you gift the same photo engraving to your family members, there will always be a slight and notable difference in the wood. Since no wood has the same pattern, each person will receive a unique gift. You can always change the text of the engraved photos. Do You Want to Know More about Engraved Wood Prints? We design our engraved photos on wood using state-of-the-art laser technology engrave the wooden surface with your picture and text. We use steamed beech timber, obtaining it from reliable suppliers to guarantee superior quality wood. Even though engraving photos on wood is our speciality, we are also capable of providing you with equally stunning results on granite and marble. How Laser Technology Allows Us to Make Excellent Engravings? Laser technology allows our expert designers to engrave wood with text and pictures with extreme precision. We use our laser’s high processing speed to create clear and accurate cuts and edges. Regardless of how complex the task is, the laser technology enables us to achieve it. You receive a high quality product in return. Ask about Engraved Photos on Wood and get answer in email. *What do you want to know about Engraved Photos on Wood? Q: I've ordered canvases and loved them. The 'adjust' option, showing exactly how it will sit, is excellent. But on the Wood version, my photo seems to be stretched vertically so the pets look tall and thin. I can't see an option to adjust the image, and the final proof is just my original photo. Will the final image look tall & thin too? Do I need to size the original before I upload it? A: Dear Debbie , Greetings! Thank you for getting in touch with us, Please kno​​w​ ​ tha​​t the online instant preview is not the ​​actual proof of the image , that option is provided for the confirmation to the customer that they have uploaded t​​he right image for the size they choose.Also as long as ​​the original image ​​you upload is in the ri​​g​​ht p​​ropo​​rtion and the good resolution there will not be any issue. ​​​​​​We process all the​​ o​​rder in a way th​​a​​t if th​​ere is any i​​ssue with respect to the resolution of the image or the proportion or the orientation of the image and our designer team thinks that it will not work we never print it for any order.We always send an email notification to the customer about the issue with the favorable solution for that as well.​​ Still if you have any concerns you can directly place the order and request the proof prior to printing by writing it in the comment box. Please let us know if we can help you further. Kind Regards, Sam, Canvas Champ. Q: There is an section for text when ordering a custom picture engraving. What if you do not want that option? A: If you only require the image and no text on the engraved plaque then leave a space in the box for the text and leave it blank. You can then select the border option and add it to your cart. I hope this helps ! Q: How can I clean my engraved print? A: You can clean your engraved print like any other wooden furniture that is cleaned, with a damp cloth to remove dust particles. Q: Can I make a name plate out of an engraved print? A: Yes of-course, we do have various font options and basic designs to engrave names in order to make a great name plate! Q: Can I use my custom picture to create an engraved print? A: Yes you can definitely use your own pictures or any custom picture and get an engraved print out of it. Q: Do they come along with stands? A: Yes Engraved prints come along with a table top stand and a hanging hook in case if one wants to hang it instead of placing on a surface. Q: What technology is used for engraving? A: We do Laser engraving on the wood. Laser engraving is the process of using a laser beam to burn or engrave on many forms of materials such as wood, metal, marble, granite, acrylic, glass and much more. Q: What kind of wood is used for Engraved prints? A: We use "Birch Wood" for engraving.